Leander Paes and Mahesh Bhupathi recorded their 24th consecutive Davis Cup doubles win to keep India afloat in the World Group play-off tie against Brazil, reducing the margin of the tie to 1-2 here today. A valiant knock of 90 runs by skipper Chiteshwar Pujara went in vain as his Indian Oil Corporation (IOC) lost the match by 23 runs against Indian Cements (IC) in the 17th All-India JP Atray Memorial Cricket Tournament for Pearls Trophy at LIC ground, Sector 26, here today. Australia's swimming coach Leigh Nugent says hygiene at the Commonwealth Games Village in Delhi is a bigger concern for him than the terror threats to the October 3 to 14 event. India's woman boxer MC Mary Kom on Saturday claimed a historic fifth successive World Championship title, beating Steluta Duta of Romania 16-6. Mary Kom, who competed in the 48kg category, had defeated Alice Kate Aparri of Philippines 8-1 in semifinal to assure herself of at least a silver in the sixth edition of the competition. The former Khel Ratna awardee from Manipur, thus, remained the only boxer to have won a medal in each edition of the World Championship. Duta had defeated Kazakhstan's Nazgul Boranbayeva 10-5 in the semifinal. Openers Davey Jacobs and Ashwell Prince shared a 147-run partnership off just 94 ball to help Warriors beat Central Districts by six wickets in their Champions League Twenty20 Group A match here today. 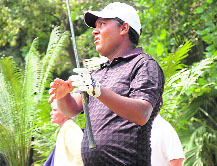 Ashok Kumar reigned supreme on the third day of the DLF Masters-2010 Golf Tournament as he shot a second successive 65 that helped him establish a formidable eight-stroke lead after Round 3 today. Ashok’s total score was 16 under 200, while Gaganjeet Bhullar, who fired a one over 73 in the third round, is placed second at eight under 208. The Himachal Pradesh (Blue) were outplayed by the Punjab and Sind Bank (PSB), Jalandhar, by 7-0 in the third day of the 7th All-India Independence Cup Hockey Tournament at the Paddal Stadium here today. The scandal-prone Pakistan cricket team today sent shockwaves through world cricket after it was disclosed that the scoring patterns in its innings during yesterday’s ODI match against England were fixed, prompting the ICC to launch an immediate probe. The 'Indian Express' faced some stiff competition from the Brazilian pair before prevailing 6-4 7-6(5) 6-1 in two hours and 19 minutes in the doubles rubber. The Indian pair saved four set points after trailing 1-4 in the tie-break of the second set to take a comfortable 2-0 lead before racing away for a win. 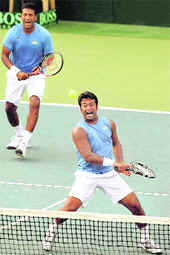 Paes, who completed 20 years in Davis Cup, served out the match for India. India came to the doubles rubber after heart-breaking singles defeats of Rohan Bopanna and Somdev Devvarman, who lost close matches yesterday. Now Bopanna and Somdev will have to win both the reverse singles tomorrow's if India are to advance to the World Group. Somdev will play the first reverse singles against world number 27 Thomaz Bellucci and Bopanna will take on 75th-ranked Ricardo Mello. India had made the elite World Group after 11 years after beating South Africa in an away tie last year, but lost in the first round to Russia to be relegated to the play-off competition. If the hosts players fail to win both the matches, India will be back to Asia/Oceania Zone Group I. Brazil have not entered the World Group since 2003 and have failed to clear the play-off hurdle in the last few attempts. Paes and Bhupathi, despite not playing together on the ATP circuit, were as good a force as they were before separating and were on top of their game today. The Brazilians were a little slow off the blocks but gradually got their rhythm and played tough tennis barring the lop-sided third set. Paes and Bhupathi remain unbeaten in the Davis Cup doubles rubbers since 1996 when they had lost to Jonas Bjorkman and Nicklas Kulti in the World Group quarter-finals against Sweden. Chasing the target of 230, the IOC could muster 206 all out in 49 overs. Earlier, put in to bat first, the IC put on 229 for 9 in 50 overs. Parsanna hit half century off 65 balls to provide relief to the team. The other notable contributors were Hemang Badani (42 off 52) and MK Sivakumar, who remained unbeaten on 43 off 50. The IOC set in their chase on a disastrous note with the scoreboard reading 20 for 3. S Suresh Kumar was the highest wicket-taker with 3 for 33. Badani won the man of the match award. The Bishnoi Cricket Club (BCC) faced second defeat in their second outing in the tourney against the Indian Income Tax (IIT) by 72 runs at DAV Sector 8, here today. Sent to bat first, the IIT put on 244 in 49.3 overs. Bhavik Thakkar played the vital role, smashing 94-run knock, studded with five boundaries and three sixes in 88 balls. In reply, the BCC were packed at 172 in 45.1 overs. 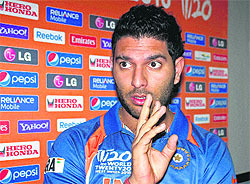 Thakkar was declared man of the match. The third match between the BSNL and BPCL was won by the latter by 34 runs. With the defeat, the BSNL has become the first team to crash out of the tournament. Chasing the target of 277, BSNL innings were ended at 242 all out in 47.2 overs. Uday Kaul, who chipped in 77 runs, was declared man of the match. "You can go to a Western-style country and still get sick, but on the subcontinent they have bugs we have no resistance to," Nugent was quoted as saying by 'The Daily Telegraph'. "Things like vomiting and diarrhoea can run rampant through a team, wreaking havoc on months of preparation and destroying medal chances. "So you have to be extra vigilant and make sure you have as many preventative measures in place as you can." Nugent said all the Australian swimmers have been given hand-sanitising gel, probiotics to boost immunity and long-sleeved shirts, long trousers and bug repellent plus mosquito zappers to guard against diseases such as dengue and malaria. "We're living in the village with probably 7000 or 8000 other people and not everyone has good hygiene, and you don't know who's touched the door in front of you," he said. "Touching things, you can pick up bugs that you're not used to in our normal environment and next thing you're sick and out of action. All of these bugs are invisible, so you have to be ultra-careful." Nugent said the swimmers have already instructed about personal hygiene during the October 3 to 14 event. "They're well educated in it, but it needs to be habitual," Nugent said. "When we're in our strategy camp in Kuala Lumpur we'll be really ramming that message home hard and prompting our athletes and our staff so that they stay fit and healthy. India's woman boxer MC Mary Kom on Saturday claimed a historic fifth successive World Championship title, beating Steluta Duta of Romania 16-6. Mary Kom, who competed in the 48kg category, had defeated Alice Kate Aparri of Philippines 8-1 in semifinal to assure herself of at least a silver in the sixth edition of the competition. The former Khel Ratna awardee from Manipur, thus, remained the only boxer to have won a medal in each edition of the World Championship. Duta had defeated Kazakhstan's Nazgul Boranbayeva 10-5 in the semifinal. Earlier, Mary Kom continued her chase for a historic fifth successive World Championship gold by becoming the only Indian boxer to enter the finals of the event with a thumping win in the last-four stage here. Mary Kom (48kg) defeated Alice Kate Aparri of Philippines 8-1 in the semifinals to assure herself of at least a silver in the sixth edition of the event. The former Khel Ratna awardee will now face old rival Steluta Duta of Romania who defeated Kazakhstan's Nazgul Boranbayeva 10-5. However, there was disappointment as well for India when Kavita (+81kg) settled for a bronze after losing 2-14 to Ukraine's Kateryna Kuzhel in the semifinals. But Mary Kom, a mother-of-two from Manipur who is the only boxer to have won a medal in each edition of the World Championship, ensured that the Indian camp had something to cheer about. After Central Districts opted to bat, Warriors restricted them to 175 for three in 20 overs and then chased down the target with five balls to spare at the St George's Park. Skipper Jacobs (74) and Prince (64) laid the foundation for Warriors' successful run-chase. With three wins in as many matches, Warriors have now virtually progressed to the semifinal, while Central Districts who have failed to win even a single match in the tournament, have been eliminated from the race for a final-four berth. 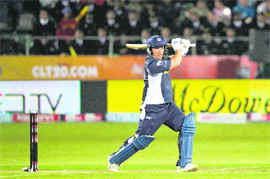 Warriors: 181 for 4 in 19.1 overs. Chasing 175 to win, Warriors started aggressively and reached 50-mark in just five overs, with Jacobs and Prince smashing the Districts' bowlers. Jacobs clobbered two fours off Micheal Mason in the first over of their innings and then hit Adam Milne for a four and a six in the very next over. Bowling: Siddle 3.5-0-29-0, Nannes 4-0-34-1, McKay 4-0-33-2, McDonald 2-0-20-0, McGain 2.1-0-18-1, Hastings 4-0-22-2. Ashok Kumar (70-65-65) hit the ball with remarkable accuracy and landed most of his shots within five feet of the pin today. He, thus, earned as many as seven birdies and an eagle, besides two bogeys. Ashok, a seven-time winner on the Aircel PGTI, got off to a flying start in Round 3 as he sank a 30-footer for his first birdie of the day on the third hole. He then birdied the fourth, sixth and ninth to go four under at the turn. It was a complete disaster for the HP (Blue) as the PSB routed the team by scoring seven goals. However, the Kulvinder-Parminder duo dominated the game with Kulvinder scoring a hat-trick. Then followed another move that enabled Parminder hitting the bulls’ eye in the HP Blue’s poor defense line. Kulvinder continued his brisk attack and scored a quick goal in the 6th minute. 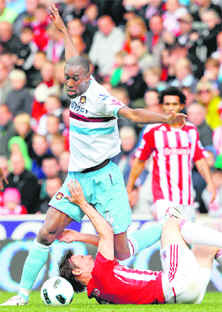 Then came another surprise move from Harinder, who scored his first goal in the 24th minute of the game. The HP (Blue) struggled in the first half, but drew a blank. The second half was an equal disaster for the Himachali lads. Kulvinder and Tejinder kept the attack moving and scored two goals in the second half. In the second match played today, the CISF defeated the HP (Red) by 3-0. Mugaru Munda of the CISF scored the first goal in the 24th minute. Then followed another quick attack with CISF’s Prateek scoring another goal in the 26th minute and the team managed to score the third goal in the 45th minute. Punjab and Sindh Bank Vs PNB, Delhi. The ICC action followed dislosures by British tabloid 'The Sun' that an individual in the Pakistani team camp is believed to be the ringleader who was taking money from bookies in India and Dubai. "The Sun is withholding details of the alleged fix while the investigation continues - but we can reveal that horrified ICC chiefs launched their investigation before the Pakistan innings had even finished. "The probe centers on an individual within the team camp who is believed to be the ringleader, taking money from bookies and ensuring their orders are carried out," the paper said. The paper also reported that bookies knew details of Pakistan's innings before the match even began and it had given the evidence to the game's governing body ahead of the game. Immediately after the news came out, the ICC said in a statement that the investigation is warranted as information about a certain scoring pattern appeared to be "correct". “The ICC has launched an investigation into activities that took place during the third One-Day International between England and Pakistan at The Oval, London, on September 17," the governing body said. “Following information received by the ICC from a British newspaper and its source, the ICC now believes a full investigation is warranted," it added. 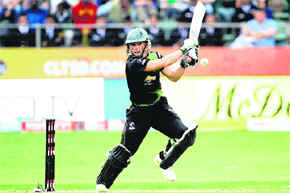 Pakistan won the match by 23 runs to keep their hopes alive in the five-match series after losing the first two games.